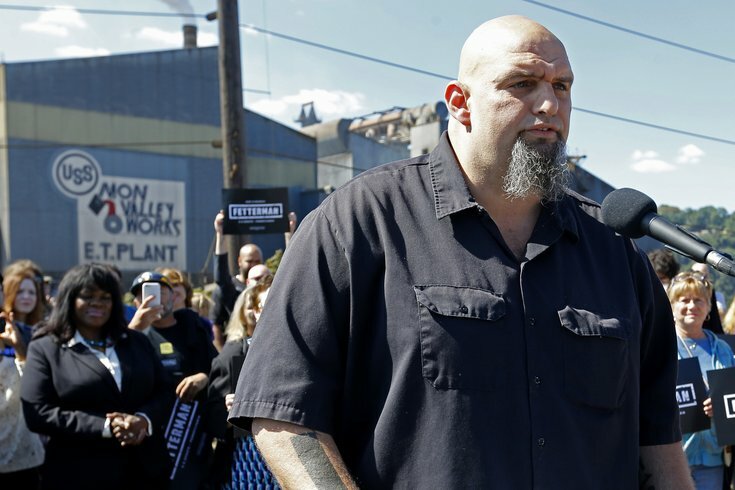 John Fetterman, the mayor of Braddock, Pa., addresses a crowd while announcing his candidacy for the U.S. Senate, Monday, Sept. 14, 2015, in Braddock. It may have been Vice President Mike Pence who cast the tiebreaking vote to confirm incoming U.S. Secretary of Education Betsy DeVos on Tuesday, but the man who hoped to challenge incumbent Pennsylvania senator Pat Toomey last November is laying responsibility for the broadly unpopular outcome at Toomey's feet. The towering mayor of Braddock, a tattooed Harvard graduate who entered last year's Democratic primary campaign as an unknown, has been relatively quiet about his political plans since losing to Katie McGinty and Joe Sestak last May. He picked up 20 percent of the Democratic vote statewide and eventually endorsed McGinty, who narrowly lost to Toomey in November. Political choices often come down to the slimmest of margins Fetterman, speaking to The Incline in Pittsburgh, said it was really Toomey's vote that confirmed DeVos. "I mean, one vote matters," Fetterman said. Thousands of Pennsylvanians have signed an online petition to recall Pat Toomey, even though Pennsylvania is not one of the 19 states (and Washington, D.C.) that allow for the recall of state officials. Opposition to the second-term senator has spiked, particularly in and around heavily Democratic Philadelphia, where Toomey has largely stonewalled a weekly protest outside his Center City offices. A facetious GoFundMe campaign to "buy" Toomey's vote — a reference to the hefty campaign donations he received from DeVos — raised more than $70,000 to benefit arts education organizations. Such a large sum donated in less than a week to a joke, of all things, underscores the level of pessimism surrounding DeVos's competency and intentions in shaping the U.S. education system under President Trump presidency. Fetterman, a Bernie Sanders-style candidate who could have used the Vermont senator's help last year, isn't necessarily ruling out another Pennsylvania run in 2022. “I’d be humbled if I get that chance," Fetterman said.